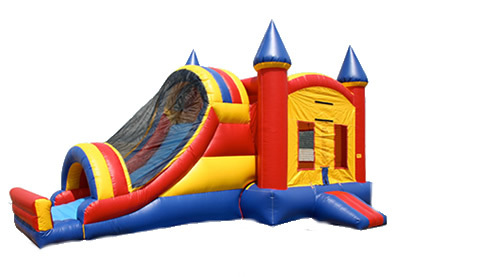 Inflatable Combo Bounces are a great way rent two styles of inflatables for a combined lower price. Most combo units combine a bounce house and an inflatable slide. Other fun combination bouncers include basketball, small obstacle bounces, tubes and tunnels, and more. Find an inflatable combo today for your next event. Inflatable combos are great when two full sized bounce house units are too large (one combo unit can take up more or less space than two separate bounce houses, depending upon how large each is). Reserve an Inflatable Combo Rental today!